Welcome. This caucus was formed within Cornell Graduate Students United by members who have been actively involved in CGSU’s unionization efforts on campus and have been critical of CGSU’s lack of engagement with its membership, as well as of the nature of its relationship with its affiliate unions, AFT and NYSUT. The guiding vision of this caucus is that the strength of a union comes from its members - from the bottom up - a strength we can only sustain and advance through participatory mechanisms that inform and empower workers, and guarantee that members’ opinions and suggestions for improvement are heard and acted upon. The opinions and suggestions presented here are, at present, those of the members initiating this caucus, and are entirely open to discussion. In fact, the purpose of this caucus is, precisely, for CGSU members (and the Cornell community at large) to engage and shape it. This caucus is, in other words, a call for participation. It’s open to all CGSU members. You can join the caucus by signing here to receive updates about the union. If you are not sure what a caucus is, this is a good place to start. And if you're interested in this caucus, but not a CGSU member, please don't hesitate reach out or to join us at our weekly meeting. What happened in the election and campaign? We, CGSU, failed to decisively win our recent recognition election. We believe that this is most fundamentally because we have not yet become a member-driven union, where all members feel empowered to participate and take ownership of our union’s future. We recognize that the affiliation with a larger federation in order to have enough resources for gaining recognition on Cornell's campus was a necessary step. Both the decision to affiliate with a larger federation and with whom to affiliate were decisions made by the members. However, affiliation should not come at the cost of autonomy, transparency, and bottom-up democracy. During our recent election campaign, we saw a culture within CGSU that tended to prioritize deferring to our national and state affiliates’ (AFT and NYSUT) decisions, and CGSU’s abilities to make independent decisions were in many ways limited during our recognition campaign. We are highly critical of the “one size fits all” organizing model and strategies that were presented to us as the only option by AFT/NYSUT. Throughout our campaign, concerns about these methods were sidelined and overruled, not least through the stifling of spaces for independent CGSU deliberation. Our campaign, as a result, alienated many members and non-members, who came to see the union as a body that is only interested in collecting cards, petition signatures, photographs. AFT and NYSUT’s “expert opinions” and “experience” displaced the more essential functions of a union: to engage and empower, to inform and listen to, its members. Our union, in the process, grew disconnected from our everyday lives. A recognition election, certainly, is a crucial step in securing workers’ rights to collective bargaining —but a union neither begins nor ends with that vote. Unions, ultimately, are about building inclusive and collective workplace power; in this sense, CGSU’s for the people despite the people reflexes have only ever been self-defeating. Cornell University is a wonderful place for many of us, but the extremely narrow margin in the recognition election signals a deep desire among many graduate students for a democratic workplace in which principles of anti-discrimination, anti-mobbing, workplace security and safety, and justice can be fully expressed and practiced. Such changes can never occur spontaneously at Cornell University: hierarchy is so deeply ingrained in the governance structure of the university, that the first sentence of Article II of its bylaws grants the Board of Trustees “supreme control over the University.” This power structure then continues down to the president, and various deans as their organizational chart shows. CGSU was formed as a horizontal democracy in an attempt to counter Cornell’s top-down structure: despite its shortcomings, its Constitution accomplishes two things: (1) it aims to guarantee a bottom-up and member-driven structure via granting the decision-making power over substantive decisions in both legal and common usage to its entire membership; (2) it prevents the consolidation and abuse of power via internal grievance, disciplinary action, and Constitutional Amendment procedures. Since affiliating with AFT/NYSUT, general assemblies have not been spaces used for decision-making, and the participation of rank and file members has understandably waned. The grievances and amendments became hassles to deal with; and not moments of self-reflection and improvement. We believe that as long as our union’s structure mirrors Cornell’s, our power to improve our workplace will be limited. Our union must be an entity by which graduate workers, and graduate workers only, have a real say on their working conditions by changing the inherent power structure and placing graduate workers at the forefront. A union that recreates the very structural inequalities that Cornell operates upon does not grant us a voice: it merely changes the gag. In order to work together to address the lack of transparency and member participation in CGSU, we have formed the Rank and File Democracy Caucus. Together, within CGSU and in a more circumspect partnership with AFT/NYSUT established on the basis of de facto recognition of CGSU’s autonomy, we envision a new way forward. To move forward with this new vision, we propose several concrete issues and actions, focused on structural changes within CGSU and on CGSU’s relationship with AFT and NYSUT. AFT and NYSUT currently control CGSU's communications channels, including access to real-time membership information, and listserv. CGSU can only communicate with its members if AFT or NYSUT staff deem it appropriate and then send a communication on to the membership. CGSU alone must be in control of its own communications. In fact, the affiliation agreement with AFT and NYSUT guarantees this on paper, but not in practice. The caucus demands that CGSU has sole access to its own website and listservs, and grants AFT/NYSUT access to information being communicated on a case-by-case basis whenever CGSU members deem it appropriate. The access granted to CGSU on Action Network is partial: CGSU’s Membership Coordinator and Communications Committee still do not have access to all features on the Action Network portal. AFT staff members (including, but not limited to, the former National Representative of AFT on Cornell campus, who’s been removed from her Cornell-related duties by AFT, and other AFT administrative staff whose Cornell duties have never been discussed with CGSU) are still Administrators on our Action Network account. AFT staff members still have access to our social media and email accounts. Thus our initial demand stands: CGSU alone must be in control of its own communications and have sole access to its own website and listservs, and all other channels of communication. AFT currently maintains CGSU's membership data. The CGSU Membership Coordinator does not have access to the membership database, but is only granted “partial” access to membership data. The granting of this “partial” access to the data by AFT was not immediate but secured via an internal grievance. Moreover, AFT has collected enormous amounts of information about our graduate worker community. This data belongs to CGSU, and as such, CGSU should be stewards of its members’ information. The caucus demands that the CGSU Membership Coordinator has direct and unrestricted access to the most up-to-date membership information. 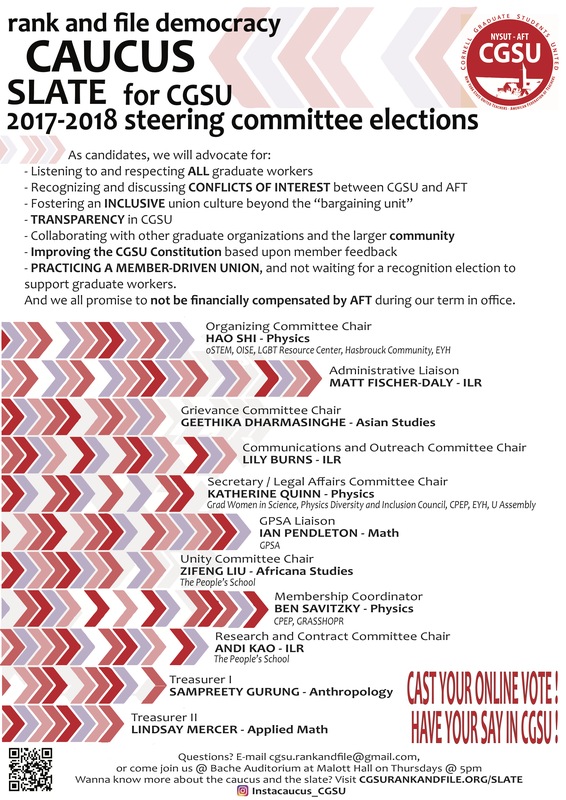 The caucus also demands that AFT share with the CGSU Organizing Committee the raw data they have collected about graduate workers while organizing for the past election. It is still the case that CGSU does not have access to information AFT has collected about our graduate worker community (including the bargaining survey entries, or staff notes about individual graduate workers based upon their conversations). It’s still also the case that the CGSU Membership Coordinator has no direct access to CGSU’s membership database (hosted by AFT), but only the partial or second-hand access of periodic Excel membership list updates. 10 CGSU members who were listed as members and who didn’t opt out of receiving communication were not receiving any communication from CGSU. These results reflect either AFT’s inability to maintain, or its unwillingness to share reliable and up-to-date membership data. We do not wish to speculate which. The question, though, underscores the necessity for CGSU to independently manage its own membership list—a practice the above reconstruction initiated. The organizing tactics and strategies deployed during CGSU’s organizing campaign for the recognition election were directly borrowed from the AFT Organizing Model. This model relies almost exclusively on “management” and “assessment” of membership by pairing union members with staff organizers to seek out graduate workers in the bargaining unit for two-on-one conversations. Rather than building collective power via informing, empowering and engaging, this model simply inscribes subordinate relations within the union. Despite widespread and repeated criticisms of the prescriptive and instrumental approaches built-into this model (some examples include, deflection of questions and criticisms towards “inoculation,” ignoring members who are fellows or who can’t vote in the recognition election, and repeated or persistent visits and phone calls to “sign” something despite “do not contact” or “do not disturb” requests) by members and non-members alike. Efforts to tailor this “one shirt fits all” model to the needs and expectations of the graduate worker community at Cornell were entirely stymied, leading to alienation and antipathy among CGSU members, as well as graduate workers at large. CGSU should be allowed to practice its own organizing model through an evaluation of pros and cons of the AFT Organizing Model. The “one shirt fits all” model justified by claims to “expertise” should be replaced by one that is based upon workers’ experiences, needs, and expectations, that takes different approaches to and cultures of organizing and socializing into account, and that is based upon a “practicing” union instead of “tasks and commitments” to “winning” it. AFT/NYSUT’s budget and timing restrictions and concerns must be fully documented and justified any time they are invoked to influence our decisions. Unions come with dues. Dues are collected from members for a variety of union programs or activities (ex: a workshop on health and safety at the workplace, or a union social gathering), paying the salaries and benefits of union leaders and staff, union governance (cost of maintaining an office, printing flyers, etc. ), legal representation, pension, health, welfare and safety funds, as well as the strike fund. It is obvious from this list that union dues are a necessary component of unionization and collective organizing. What is not obvious is the reasoning behind the amount of dues we pay to AFT/NYSUT. More transparency is necessary to help members and non-members understand how dues are used. AFT/NYSUT should provide for posting on CGSU’s website a detailed breakdown of the purpose and amount of dues that will go to them, and should promptly respond to questions members have about dues. The current affiliation agreement authorizes CGSU’s Organizing Committee as the body of CGSU that should be in relation and cooperation with AFT/NYSUT for the purposes of the organizing campaign. However, AFT staff members were present in practically all spaces and meetings of CGSU (including the General Assembly and the Steering Committee meetings and regular meetings of other committees), leaving no “member-only” spaces for CGSU members to gather and discuss, and carry out union responsibilities. Such extensive involvement that presumes that “everything falls under the organizing campaign” compromises CGSU’s autonomy, despite its recognition by AFT/NYSUT on paper. The caucus demands that the extent of AFT/NYSUT’s involvement with CGSU’s regular meetings and internal functioning should be clearly outlined as opposed to simply and vaguely “recognized.” CGSU member-only spaces should be respected as opposed to occupied and micro-managed. A proposition might be to initiate an invitation system wherein AFT staff join CGSU meetings upon invitation by CGSU for consultation, information-sharing, or other purposes. An AFT staff member was present during our last General Assembly meeting that took place on April 18, 2017 without formally announcing his presence. We respect the labor and dedication of the AFT and NYSUT staff members; because first and foremost, they are workers. We are also aware of the maltreatment and pressure that they are, at times, subjected to by graduate workers, as well as by their own employers, AFT and NYSUT. This partially arises from the fact that CGSU members had no say in, and very little knowledge about, how many full-time, part-time, and member-release staff members were employed in our campaign, who they were, and what their tasks and responsibilities were. CGSU should be consulted about staffing of its own campaign, should have access to a full record of full-time, part-time, and member-release staff members, should share this information with any member upon request for transparency, and should be part of determining tasks and responsibilities of staff members as stipulated by the affiliation agreement. As the document governing internal affairs within the union, the CGSU Constitution establishes the rights and obligations of members, channels of communication and procedures for decision-making, and grievance procedures for addressing violations and misconduct on the part of members and the union. Although the Constitution contains shortcomings and gaps, it also clearly specifies processes for amending and revising its provisions. The flaws of the Constitution should not be used as a pretext to scrap the democratic processes enshrined therein, but open to discussion among membership to refine and improve the mechanisms through which the union operates. In recognition of these weaknesses, we propose that open forums, debates, and discussions take place to generate ideas and suggestions on how to improve and strengthen the Constitution. Possible areas of improvement include: clarifying internal decision-making processes and enhancing democratic accountability, implementing better procedural guidelines for managing and resolving grievances, delineating committee responsibilities, filling vacancies for elected positions, and putting in place mechanisms for collective bargaining. In light of these suggestions, we suggest holding a retreat in addition to other forums for member involvement to discuss possible revisions. The Legal Affairs committee would then be responsible for drafting amendments and changes to the Constitution over the summer. Additionally, any member(s) can propose amendments. The affiliation with AFT/NYSUT should not automatically presume that the interests of the CGSU membership will always be completely aligned with those of AFT/NYSUT. In fact, there have been concrete examples of conflicts of interest in the past. For instance, AFT unilaterally changed the passwords for CGSU’s website and gmail account in October 2016 and prevented CGSU from accessing its own website and email account for almost three weeks. AFT refused to share these passwords with CGSU despite repeated requests from elected Steering Committee members. The issue was not resolved in good faith, but instead through an internal grievance submitted to the Steering Committee by the CGSU Membership Coordinator, demanding that Steering Committee take action to recover the passwords from AFT. The caucus demands that CGSU adopt rules in its bylaws to ensure that graduate workers who receive financial compensation from AFT/NYSUT do not serve in elected positions of CGSU. This demand is not in opposition to the employment of graduate workers as part-time release staff members of AFT/NYSUT -- members may choose to work for AFT/NYSUT for a variety of reasons, not the least of which is the need for financial support for their living expenses. This demand aims to avoid the compromise of the autonomy of CGSU, and to ensure that graduate workers employed by AFT/NYSUT not be financially affected or subjected to employer pressure when and if conflicts of interest arise between AFT/NYSUT and CGSU, reflecting the need for transparency and accountable unionism. Please see our Q&A section for the commentary from the caucus on the internal grievance regarding an issue of conflict of interest that was submitted by a member of CGSU on Dec 2016, and was discussed and dismissed during the last General Assembly. Crucial substantive decisions about the tactics and strategies of CGSU have been monopolized within the Organizing Committee, a body that meets once a week at 6:00 at night. We demand that substantive decisions be made in consultation with the membership, with relevant information about decisions to be made widely circulated to the membership ahead of time. Against a background of disputed election results and concerns about election conduct on both sides, CGSU has entered negotiations with Cornell University. For CGSU and AFT/NYSUT, clearly, the goal of these negotiations will be favorable conditions for a second recognition election in the medium-term. What that goal looks like in any detail, though, and, in particular, how it relates to members’ concerns, remains utterly unclear: the vast majority of CGSU members were never asked—or even informed of the existence of—the questions Should CGSU enter into negotiations with the university? and, If so, what should it negotiate for? In light of these concerns, the negotiation committee’s been declared open to any member. This is a welcome development. But it came only after a series of communications and deliberations by AFT and Cornell’s leadership and counsel, and decisions by CGSU’s Organizing Committee, utterly unknown and unsuspected by the membership at large. More importantly, it’s still not clear what say our membership will have in approving or disapproving whatever comes out of these negotiations and when and in what conditions they should stop. In the recent recognition election campaign, we saw many of our fellow graduate colleagues who raised concerns about CGSU labelled as “anti-union,” “irrational,” dismissed out-of-hand, morally condemned and never engaged with again, apart from during the “getting out the vote” campaign. We contend that these labels are destructive and divisive in terms of fostering a welcoming environment for rigorous debate about the vision of our union, and the dismissive attitudes counterproductive to welcoming graduate worker engagement and voices to and within our union. The caucus demands the creation of sustainable and inclusive spaces within and through CGSU for open, honest debates about how to shape our union to best serve the interests of our membership. In the absence of established structures for robust and honest debates taking place within CGSU and among graduate students regarding unionization efforts on campus, caucus meetings are de facto serving as such a space, open to all graduate students to fulfill such need.